Like Merchant Ships: Handmade Gifts Are Best! What could be more thoughtful than a handmade gift? When the giver double-checks your colors via blog, of course! 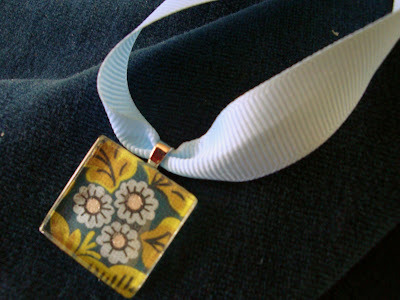 Above, darling pendant from my friend Anne Marie. You can read her step-by-step tutorial here. 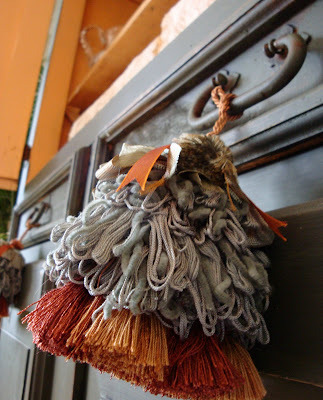 A pair of fluffy tassels from the Nester! They truly are the prettiest things you'll never need. Nester probably doesn't realize this, but she and I own the exact same secondhand armoire. I prettied mine up for the dining room and use it to store all my linens and serving pieces. See how Nester incorporated hers into a playroom shelving system here! Meredith, I thought it look the same (after scrutinizing every detail of every photo on your blog and Nesting Place). I have told so many people about your armoire painting escapades, most recently just last week when a friend mentioned wanting to update hers. I felt like a stalker admitting to you that I'd scoured your blog for pictures of you to see what colors you wear most! Glad you liked the pendant! I love to give (and receive) handmade gifts! The hold so much thought and love and personal touches. I think that handmade gifts are a lot more meaningful than "boughten" gifts. Oh, I know we have the same one. Ever since I saw yours painted black I've been wanting to paint mine! I have the same entertainment center plus a matching bookshelf on on each side! I bought it off Criagslist for $200 amd love it, love it, love it! My husband had to cut the sliding panel in back a bit taller so our tv could fit but it was well worth it. I actually saw the same man posting this item last summer for $600. I guess his bad luck in not selling was my good fortune! I love what both of you have done with it. I like the pendant and bookmarked the tutorial for future reference. I'm wiping up the drool....Nester's tassels are SO cute. And I love that pendant. Definitely going to have a look at that tutorial.